Build a software solution that understands your online arbitrage model, is fully customizable to your preferences, and is compliant with pricing logic of various ecommerce stores. Enable auto listing of products with your seller account from the product list curated by the online arbitrage software. Make the most of your online arbitrage with a powerful pricing algorithm that takes in account shipping and referral fees. Limit utilization of resources to a product according to its sales velocity and volume rather than equally distributing the resources. Get notification when an action can’t go on without your intervention and requires you to reply with your action of choice. It may look like that the market is overcrowded with such software solutions, however, only a few have the expertise of eSellerHub when it comes to online arbitrage software. The software monitors each product for changes in prices and availability. The changes must reflect in the listing or the seller might lose money and reputation. CAPTCHA prompts can bring an online arbitrage to a standstill. That’s not the case with ours as we integrate CAPTCHA passers in our custom software builds. The software can take calculated decisions based on the users’ preferences it learned over the time when matching products, fixing prices or predicting demand. When a product is shipped a tracking number is generated. The software will push the tracking details to the user for active tracking of their order. There tens of hundreds of options you can get included in your custom online arbitrage software solution. Nevertheless, we recommend these principal features. Sequence several operations and trigger them when an event occurs or the time strikes. For example, when server overloads, you can restrict ordering. Run custom scripts inside the software to automate routine, monotonous tasks and employ your human resources in a more productive part of the business. Software admin can broaden the scope of the solutions by means of extensions, which truly adds value to the investment into the software solution. Although the software commits most tasks itself, the admin can override most of the actions. It can abort the operation or make a modification. The return manager takes role whenever a customer returns an order and don’t settle unless the money is refunded or the customer receives replacement. Get intelligent insights on your online arbitrage: which strategies are working, which aren’t. Learn from the date and improve the process efficiency. 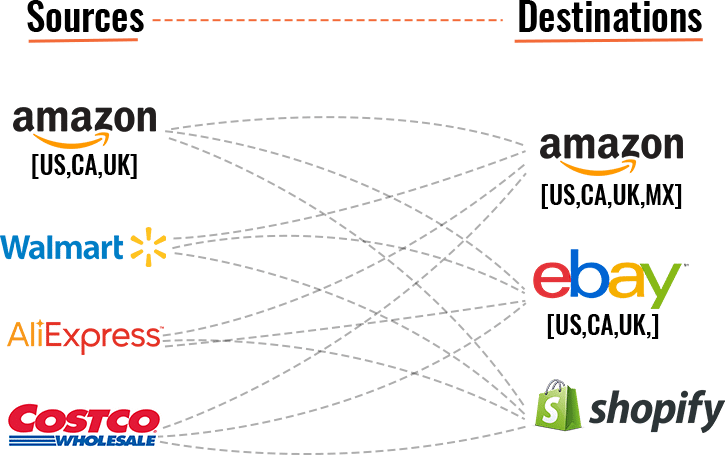 No matter, where you buy from or sell on whether Ali Express to Amazon or EBay to Walmart, we know the rules of game and how to play by it.